This is another DFRobot customized high quality product. It is a simple 2 phases hybrid stepper motor. It features 3.5kg high torque output. It is applied in most CNC machine or 3D Printer such as Makerbot and Ultimaker. If you want to make your own CNC or 3D Printer, this motor is the most suitable one. Usually, a CNC machine requires 3 motors and a 3D Printer requires 4. Trying to find the right stepper motor is not an easy job. 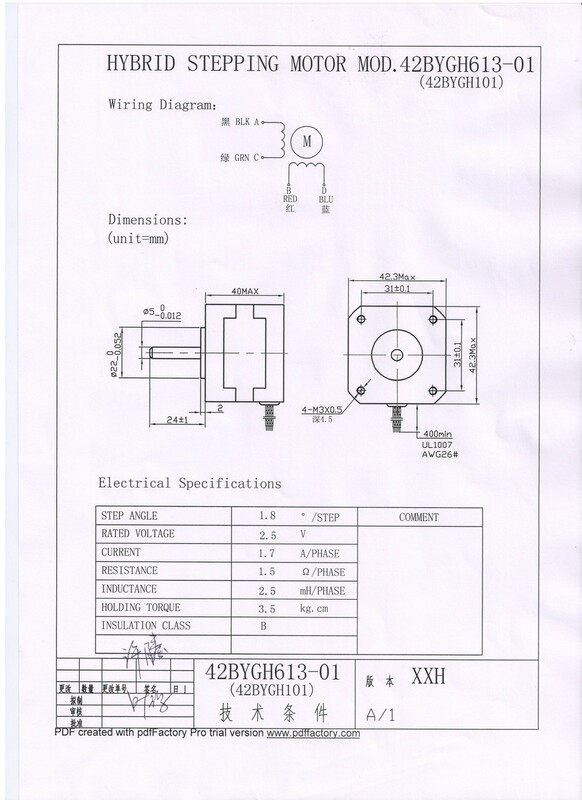 There are so many stepper motor in the market with variant quality and price. After testing more than 10 different stepper motors, we finally had one that meets our quality and price requirements. This motor has been passed DFRobot Lab 3 months continuous running tests. It was installed on our 3D printer for 24x5 running for 3 months, and it is still servering its role. For that reason, we highly recommended this motor to 3D Printer community. It comes with 4 pin JST connector which is compatible with Ultimaker control board, the cable length is 50cm. A stepper motor is a brushless DC electric motor that divides a full rotation into a number of eq..
Do you want to do some projects with stepper motors such as an auto curtain, a XY Plotter, ..